Last week was a tough week for us. Thursday morning, we were awoken to the sad news that Akber's grandmother had passed away. She had led a fruitful and energetic life well into her nineties. She had been battling minor illnesses that come with old age for a while. Still, our hearts were heavy with sadness. Akber left to accompany his parents to Dar es Salaam and be with the family. That left me and Maryam plenty of alone time. Usually, our days would have been filled with play dates, park walks and swim time. However, with the scorching Dubai summer and me fasting, we have had no choice but to remain indoors. Instead, our days have been filled with lots of baking, partly for her but mainly for me. To keep my mind occupied. She helped with whisking, pitting dates- anything to get her hands dirty. We made these light and moist sticky date puddings together. Topped it with a smooth toffee sauce and some whipped cream on the side. 'One for Mummy, one for Maryam.' Or maybe two. 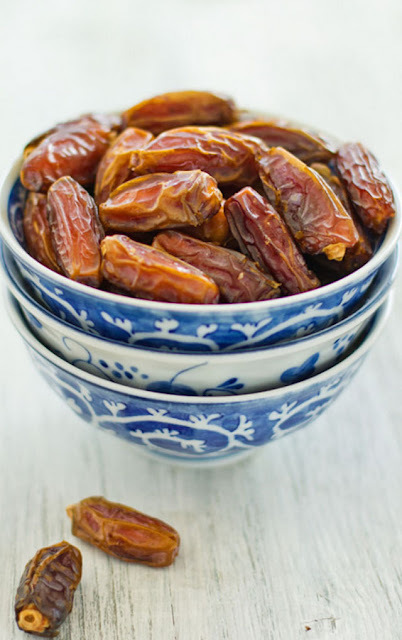 Dates are a favorite of Maryam. She thinks they are chocolate and I'm not complaining. We took some of these puddings for Iftar at my sister's house where I have been breaking my fast since Akber has been away. It is an unspoken tradition to bring a small token or gift for the hostess. And what better than a home baked dessert- light and airy. Rich, yet filling. With extra toffee sauce on top. Any leftovers? I saved a couple for Akber when he returns this week. I'm sure he'll appreciate it. Preheat the oven to 180 degrees Centigrade. Grease a mini bundt pan with baking spray. Place dates, water and soda bicarbonate in a blender and blend to a paste. Set aside. Cream together the butter and sugar until light and fluffy. Add eggs, one at a time. Add the vanilla. With the mixer on low, stir in the flour. Fold in the date paste. Pour mixture into the mini bundt pan until each mold is 3/4 full. Bake for 20-25 minutes or until a skewer comes out clean. To make the toffee sauce, mix all the into a pan and place on low heat for 5 minutes, mixing every now and then until incorporated. Once the sauce has come to room temperature, it will thicken. To get it back to the right consistency, you can reheat it. Serve the puddings hot drizzled with toffee sauce and some whipped cream/mascarpone on the side (I made the puddings in the morning and reheated them at night in the microwave). Makes 15 mini bundt cakes. Recipe from here. I absolutely love how they look. The pictures of Maryam are adorable as always mashallah! So sorry to hear about Akber's grandmother- may Allah grant her Jannah. Sorry to hear of your loss. Maryam is so precious. 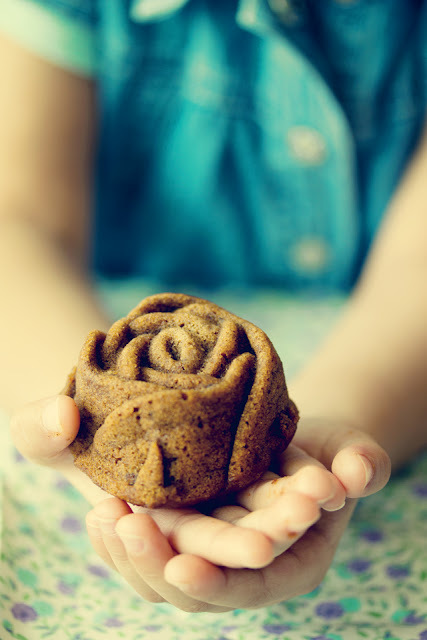 She will be a fabulous baker like her mother! I love the rose shape! look marvelous. your daughter is so darling cute. You are creating beautiful memories for your daughter Sukaina. Beautiful post as always. My son was seeing the pics with me, and saying, mmmm yummy! Looks like you have a 3 yr old fan. Mmmhhh, delicious! I love the clicks with your daughter. These looks so yummy! 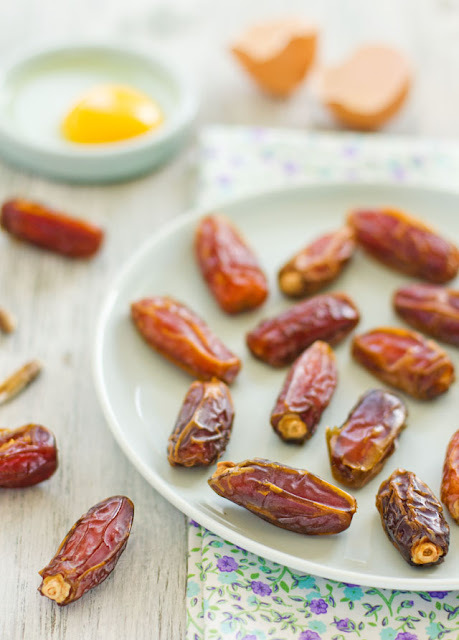 Perfect for Ramadan with the dates. 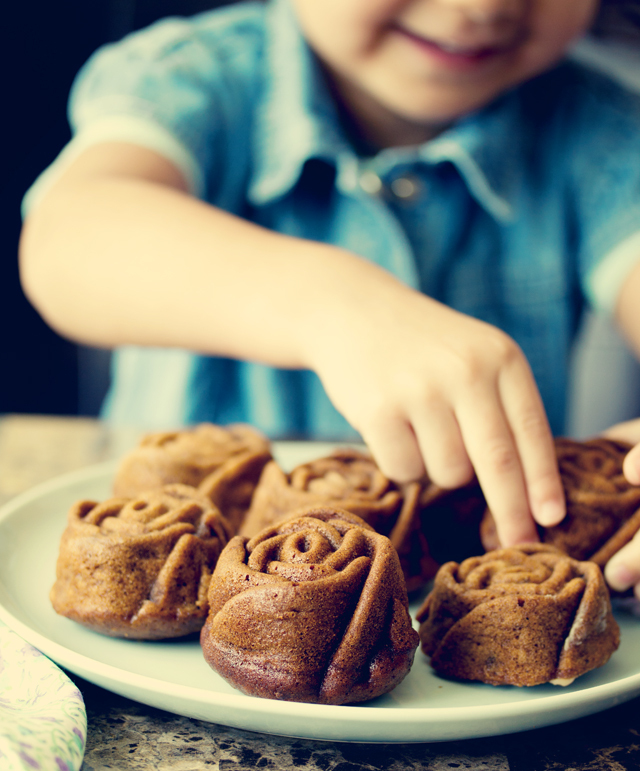 How do you get your cakes to come out so perfectly from the pan? I have so much trouble with things sticking in these intricate pans. I've tried greasing and flouring but something always sticks. I am so sorry for your loss, Sukaina. This recipe looks incredible! 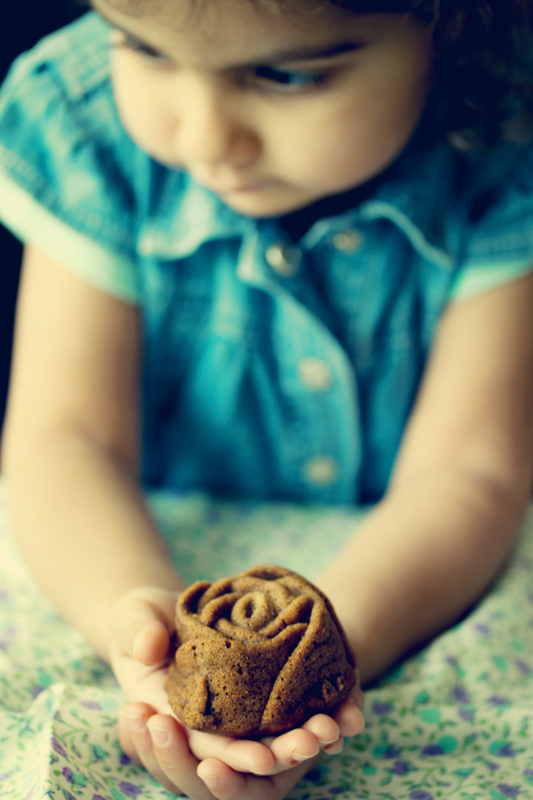 Sorry for you loss,Sukaina.Your daughter looks adorable,Mashaallah.This recipe brings back memories of date pudding I used to make,but now forgotten.Great clicks.Love it. Sorry to hear about the loss of Akber's grandmother. 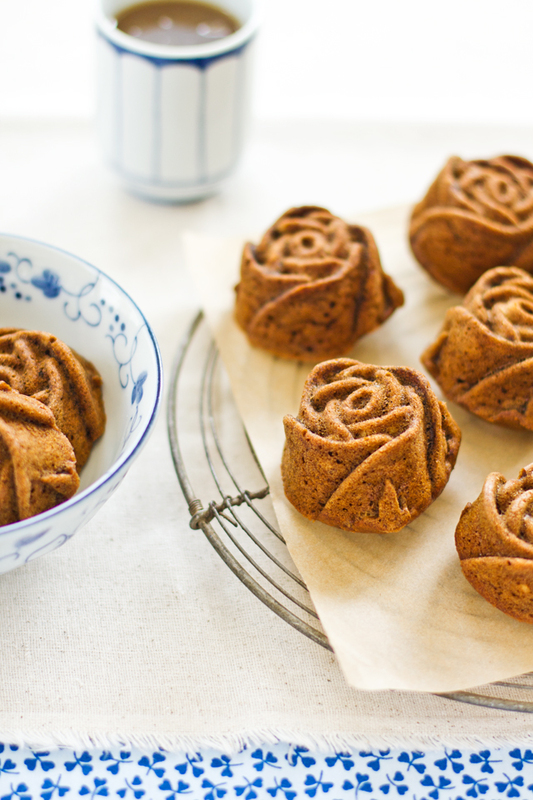 Your sticky date puddings look adorable, I love the rose shape. The sticky toffee sauce looks absolutely amazing. Yum! The date puddings look delicious! I think I have to whip up a batch very soon given the amount of dates we bought lately. So sorry to hear about the loss Sukaina.Its a difficult time for your family ..my prayers are with you. My sincerest condolences to you and your family Sukaina, I'm so sorry to hear the sad news. Hope to see you next week lady. Sorry to hear the bad news of your family, Sukaina. Btw, I have been baking date cakes too recently, and my kids also think it's chocolate. My deep condolences to you and your family, I'm sorry to hear the sad news. B/W These cakes look divine!!! As always beautiful pictures. 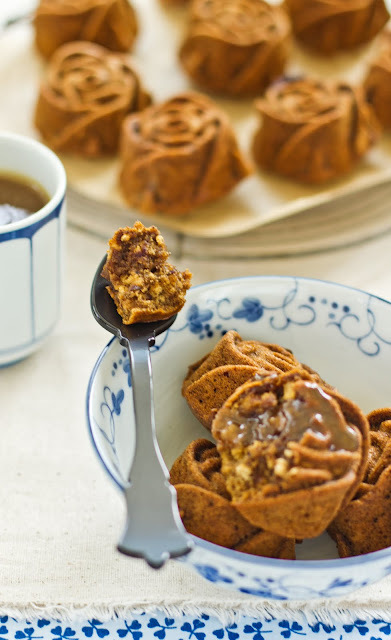 I remember my mom's best friend and our aunty Nasreen would make these date cakes when we were little. It tasted out of the world although did not look half as gorgeous as yours and I never knew her recipe. Haven't seen her for ages but you just reminded me of some unforgettable tastes from my childhood! This is a beautifully photographed post with a fabulous recipes and I absolutely love your bowls. Undoubtedly, the most beautiful sticky date pudding I have ever seen. My sympathies to your family, Sukaina. Asiya- I used baking spray which is a combination of oil and flur. They came out very easily. Thanks everyone for stopping by and commenting. Sorry for your loss. What a gorgeous dessert. Your daughter is precious. Sorry for your loss. I love sticky date puddings!To make things easier, I sometimes buy the date paste available here. Saves time pitting and softening dates. Sorry to hear about your loss, dear. *Hugs* Love these sweet cakes and photos, especially the 3rd from the top with your little one holding one. Sorry to hear your news. I've never seen rose shaped sticky date puddings before - how gorgeous. my condolences to your family Sukaina. the shapes are so pretty and you are making beautiful memories with these pictures with your princess... she is going to be in awe going over these posts when she grows up and understands. The toffee sauce sounds out of the world! Sukaina, I am so sorry to hear about your family's loss. To lose a loved one is always so hard. The comforting thing is seeing how you and Maryam are making lovely and delicious memories together - I love sticky toffee pudding - but yours are the most elegant I have seen. I am sorry to hear of your loss. 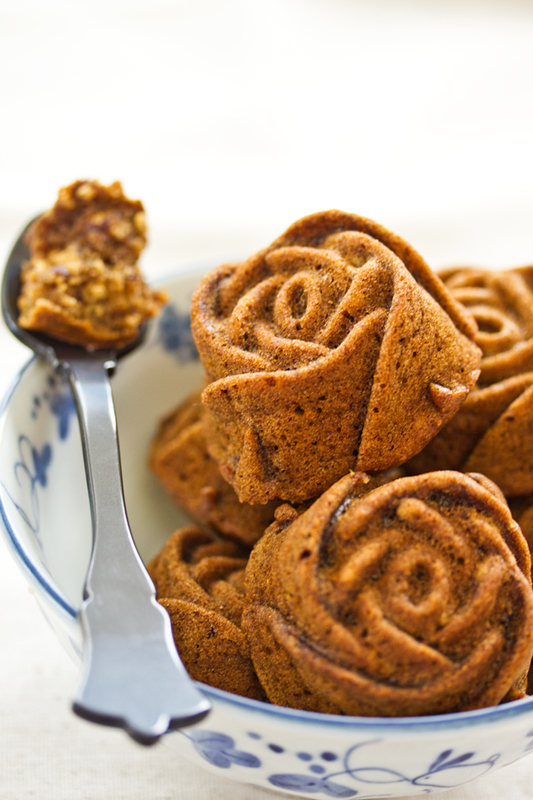 I love your photographs, I would like to try the sticky date cakes even though I don't like dates!!!! Sorry to hear about your loss Sukaina, I hope Akber is ok.
What gorgeous rose tins! I love sticky toffee puddings - I usually put a bit of ginger in the toffee sauce which is awesome. Sorry about the loss :( I know you must be missing Akber!! The puddings look picture perfect and very decadent. 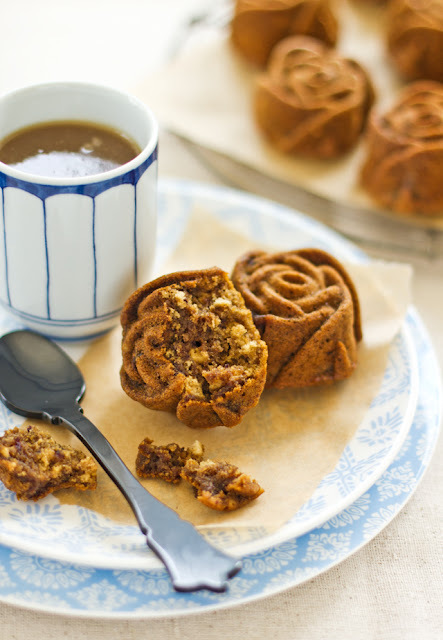 Toffee and date is such a fabulous combination. Thanks for sharing! 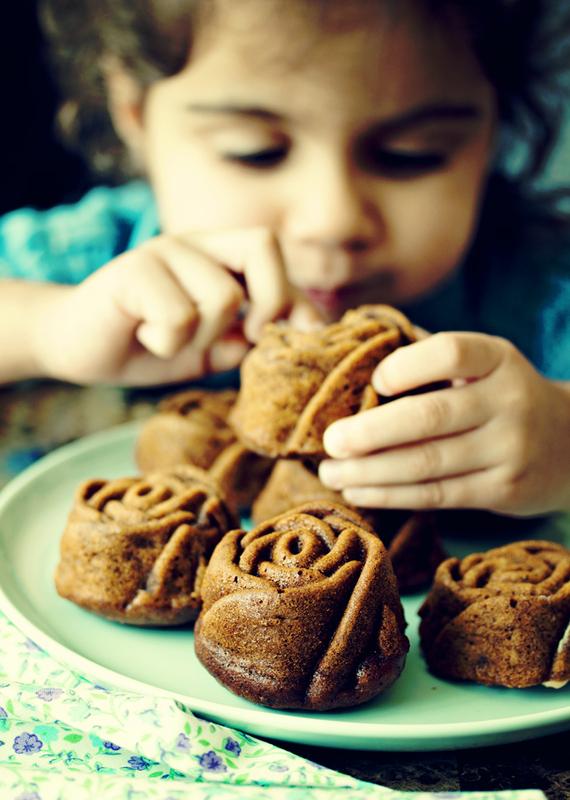 Love the pictures of little Maryam and the priceless time she spends with you in the kitchen. She is PRECIOUS cute! Love this cupcake/pudding and the way you chose to make them. 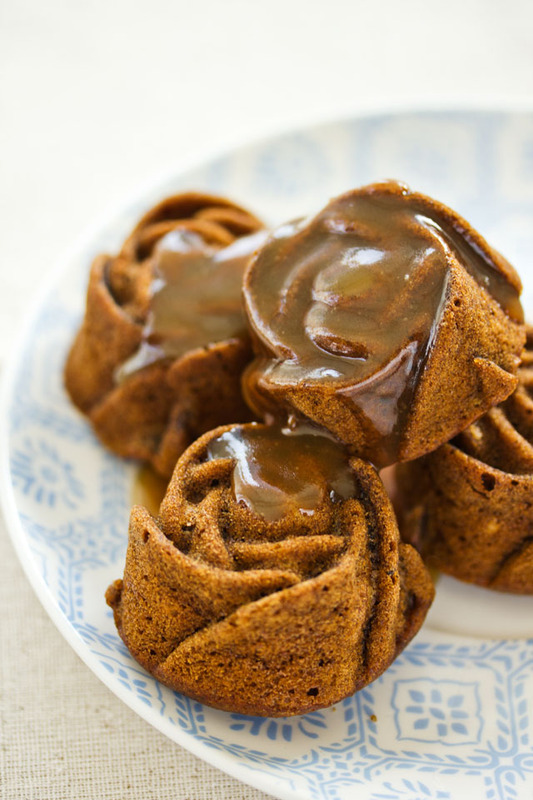 Must try these one day, caramel sauce and all. YUM!! I am sorry for your family's loss. Even in old age, expected or not its hard to say goodbye to a piece of the puzzle. I still miss my Nanny so much. As for the puddings, they are so beautiful I want to buy a pan and make them NOW! I love dates. I am with Myriam. They are like candy to me! Sorry to hear about your loss...may God give u enough strength to overcome this.. I've been following your blog for a while already and I am always impressed by the quality of your recipes, your beautiful way of writing and your gorgeous photographs. Your blog is a true joy to visit and a source of inspiration!